I’ve just returned to New Zealand from a wonderful week on Australia’s Sunshine Coast, where I sampled a huge range of beers (that’s what holidays are for, right?) including this one: Twisted Palm Tropical Pale Ale by Burleigh Brewing Company. I bought a six-pack of this beer at a bottle shop in Caloundra and proceeded to drink half of it in the sweet sunshine at my hotel, overlooking the swimming pool; I drank the rest of it the next day, up the road in sunny Mooloolaba. Blurb on the bottle: An easy drinking, laid-back pale ale with hop-driven tropical characters of orange, mango and papaya. The review: They’ve got that right; Twisted Palm Tropical Pale Ale is extremely easy to drink (especially in the sunshine), with subtle characters of orange, mango, and papaya – kind of like a tropical fruit salad in beer form. With that in mind, it wouldn’t be appropriate to drink this beer somewhere cold. 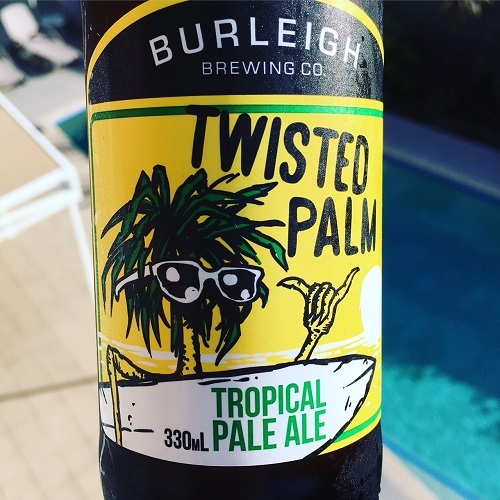 Burleigh Brewing Co.’s Twisted Palm is a product of the warm climate in which it has been brewed. It’s a summer beer (or only a winter beer if you happen to be drinking it on the Sunshine Coast, where I can’t believe that it’s still tshirt-and-shorts weather). It’s light, refreshing, and sessionable.